* You can then show the video by calling showOfferwall(). Value will change to NO when Offerwall isn't available. * Invoked when the Offerwall successfully loads for the user. *@param desc - A string which represents the reason of the failure. * @param dict - A dictionary which holds the credits and the total credits. * @param desc -string object that represents the reason of the  failure. The default setting in your ironSource account notifies you of user’s completions or rewards via the ironSourceDidReceiveCredit callback within the client of your app. Alternatively, you can turn on server-to-server callbacks to receive notifications to your back-end server. 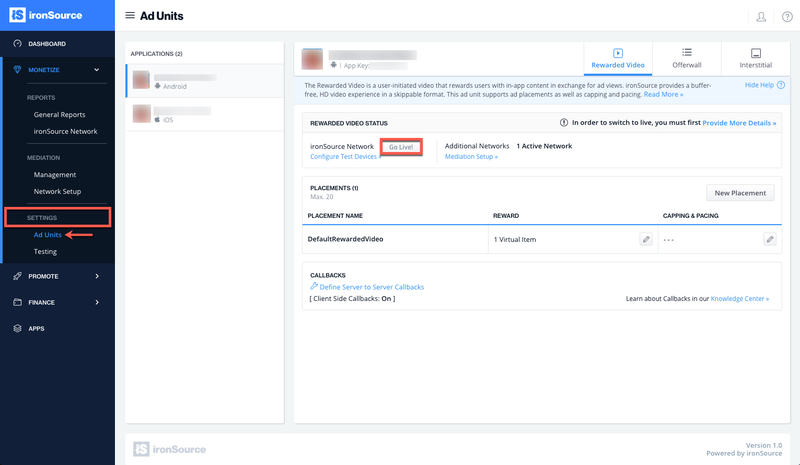 Once you select server-to-server callbacks you will not receive client-side notifications. Note: If you are using automatic client-side events, we recommend adding the proactive polling method and checking the user’s reward status on app launch, upon in-app store entry and in the case a user opened the Offerwall, ardently verifying every 5 minutes after the user closes the Offerwall to ensure you don’t miss the latest update on the user’s rewards.